WHAT JUST HAPPENED KDUSBUCKNSU2JXH2K HD IEVZIEDUH2HSURYUDBDUJDHQUZREUNXISBYSIFJDHAIDHU I NEEDDDDD THE SEQUEL RIGHT NOWWWWWWW!!!!!!!! Why? WHY, Soman Chainani, WHY??? I NEEEEEED THIS BOOK. Curse the cliffhangers. What do you mean, March 2019?! THE WAIT IS GETTING LONGER, EVERYONE! I don’t think I’ll make it to March 2019. That’s too much for me. I‘ve been waiting for this book since the moment I finished reading 4th book. And now when I finished this book, I cannot wait for the 6th book to come out!!! Soman Chainani books are my meaning of life: I finish one, I wait for another. He has an extraordinary talent to finish every chapter like an episode of a TV show making you lust to read more and MORE AND MORE because you MUST know what happens next. When I read his books- I lose the track of time, with this book I couldn’t notice when the I‘ve been waiting for this book since the moment I finished reading 4th book. And now when I finished this book, I cannot wait for the 6th book to come out!!! Soman Chainani books are my meaning of life: I finish one, I wait for another. He has an extraordinary talent to finish every chapter like an episode of a TV show making you lust to read more and MORE AND MORE because you MUST know what happens next. When I read his books- I lose the track of time, with this book I couldn’t notice when the morning sun started rising, because this book truly worked for me as a Crystal of Time: there was Present and no Past for me, there was only a second that lasted forever in his magical world. Only good books can do such things. Honestly, Chainani can give me a 1000 page book on just Tagatha cuddling or Sophie changing bath mats into dresses and I WOULD STILL READ IT. Just reading this book, this series, these characters are my children and my family and I am going to be so sad to not continue reading their stories. I am hoping that it will be an Ever After ending (I don't wish that for the Snake though, he can go die!) but I am going to cry and--oh, yup, not going to think about it. A Crystal of Time starts off running--literally! It picks off with Agatha on the run from Rhian after he takes over as king and imprisons all her friends. It goes from there with nonstop action and so much crap just thrown at these characters and the world! I think at some points the humor was jarring and ruined the mood, but, other than that, this book was SUCH a delight! It felt like I was reunited (with old friends and world) and IT FEELS SO GOOD...except NOW I HAVE TO WAIT. I just love all the little Tagatha moments, Sophie being a badass enigma, Hort is soft, Tedros gets jealous of SophieAgatha friendship/homance, taking baths to enter a crystal ball, SheriffRobin team-up, the Coven, Evelyn Sader still causing mayhem after death...oh yeah, the fuckery that is named Arthur and his relationships with women just can not be contained within his pants! I think this book is more of a set-up to the last book but I still enjoyed it. I especially loved reading from Dovey's POV...that chapter really tore me up it was so beautiful, I loved it. This book in general was SO GOOD. (Look at that hella gorgeous cover I might add.) The only thing I hated was the fact that I didn't have more time in a day to read it and had to read chapters here and there! Tedros levels-up, as in he's growing just as much as Sophie is! I feel that this arc really lets us see his growth in character, something we got to see in Agatha and something we continually see in Sophie. So it was so refreshing for him to admit and realize he is selfish and isn't fit to be king but realizing that, yes, that is his throne and he's supposed to be king. Also, we get jealousTedros™ that I have been waiting for. I mean he's jealous of Sophie but still hilarious that he wants to be part of their sisterly bond. And besides, Agatha is just too Good for BOTH Sophie and Tedros! Sophie is still so complex and slaying! She pretends and loves and stays loyal. But above all, she cares so much for Agatha and that is so great to see, none of that Sophie causing drama and more Sophie helping fight drama in that dramatic flair. And my daughter Agatha using her animal abilities, saving her prince in distress, and looking killer in black. She's just perfect, what else can I say? We all know she deserves to be queen but how about king? King Agatha? -REAPER IS KING. A cat is king of gnomeland! Go Reaper--also go Reaper thinking Tedros wasn't good enough for Agatha! We all know that! -The first years are so adorable! This isn't really spoilery but I mean they are just adorable!--brings back that first year Agatha, Sophie, Tedros nostalgia! -Japeth and Aric...more than friendship? Possibly adorable? -Dovey dying and seeing Lesso again X( can you not? That is the best ship there is! -The dresss that Sophie wears um wow, stunning! Please, Soman, PLEASE. Don't throw the character development you've given Sophie away, PLEASE. That's honestly all I ask for. I wonder if Agatha will go back in time on that next volume. The end of quests for Glory left me heartbroken, seeing Agatha and Tedros separated, and Tedros angry at Agatha to the point of jeopardizing their love, destroyed me. I love Agatha and Tedros and wait to know what will happen is very difficult. 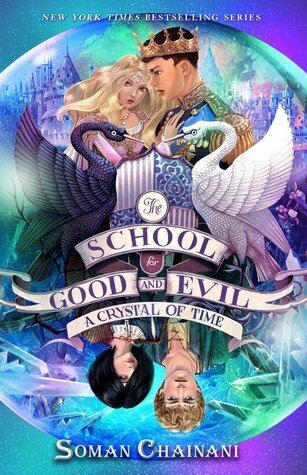 Soman Chainani - Soman Chainani's first novel, THE SCHOOL FOR GOOD AND EVIL, debuted on the New York Times Bestseller List, has been translated into 26 languages across six continents, and will soon be a major motion picture from Universal Studios. As a writer and film director, Soman's films have played at over 150 film festivals around the world, winning more than 30 jury and audience prizes, and his writingawards include honors from Big Bear Lake, New Draft, the CAPE Foundation, the Sun Valley Writers Fellowship, and the coveted Shasha Grant, awarded by a jury of international film executives. When hes not telling stories or teaching in New York City, Soman is a die-hard tennis player who never lost a first-round match for ten years . . . until he started writing THE SCHOOL FOR GOOD AND EVIL. Now he loses all the time.